The philosophy of happiness is the philosophical concern with the existence, nature, and attainment of happiness. Philosophically, happiness can be understood as the moral goal of life or as an aspect of chance; indeed, in most European languages the term happiness is synonymous with luck. Thus, philosophers usually explicate on happiness as either a state of mind, or a life that goes well for the person leading it. Plato (c. 428 – c. 347 BCE), using Socrates (c. 470 – 399 BCE) as the main character in his philosophical dialogues, outlined the requirements for happiness in The Republic. In The Republic, Plato asserts that those who are moral are the only ones who may be truly happy. Thus, one must understand the cardinal virtues, particularly justice. Through the thought experiment of the Ring of Gyges, Plato comes to the conclusion that one who abuses power enslaves himself to his appetites, while the man who chooses not to remains rationally in control of himself, and therefore is happy. He also sees a type of happiness stemming from social justice through fulfilling one's social function; since this duty forms happiness, other typically seen sources of happiness – such as leisure, wealth, and pleasure – are deemed lesser, if not completely false, forms of happiness. Aristotle (384 – 322 BCE) held that eudaimonia (Greek: εὐδαιμονία) is the goal of human thought and action. Eudaimonia is usually translated as happiness, but "human flourishing" may be a more accurate translation. Eudaimonia involves activity, exhibiting virtue (arete, Greek: ἀρετή) in accordance with reason. Within the Nicomachean Ethics, Aristotle points to the fact that many aims are really only intermediate aims, and are desired only because they make the achievement of higher aims possible. Therefore, things such as wealth, intelligence, and courage are valued only in relation to other things, while eudaimonia is the only thing valuable in isolation. Aristotle regarded virtue as necessary for a person to be happy and held that without virtue the most that may be attained is contentment. Aristotle has been criticized for failing to show that virtue is necessary in the way he claims it to be, and he does not address this moral skepticism. Antisthenes (c. 445 – c. 365 BCE), the oft regarded as the founder of Cynicism, advocating an ascetic life lived in accordance with virtue. 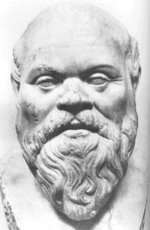 Xenophon testifies that Antisthenes had praised the joy that sprang "from out of one's soul," and Diogenes Laertius relates that Antisthenes was fond of saying: "I would rather go mad than feel pleasure." He maintained that virtue was sufficient in itself to ensure happiness, only needing the strength of a Socrates. He, along with all following Cynics, rejected any conventional notions of happiness involving money, power, and fame, to lead entirely virtuous, and thus happy, lives. Thus, happiness can be gained through rigorous training (askesis, Greek: ἄσκησις) and by living in a way which was natural for humans, rejecting all conventional desires, preferring a simple life free from all possessions. 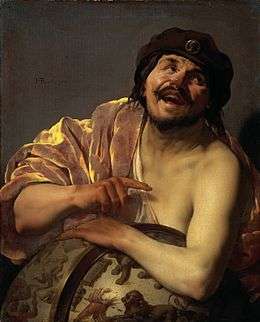 Diogenes of Sinope (c. 412 – c. 323 BCE) is most frequently seen as the perfect embodiment of the philosophy. The Stoics themselves saw him as one of the few, if not only, who have had achieved the state of sage. Stoicism was a school of philosophy established by Zeno of Citium (c. 334 – c. 262 BCE). While Zeno was syncretic in thought, his primary influence were the Cynics, with Crates of Thebes (c. 365 – c. 285 BCE) as his mentor. Stoics believe that "virtue is sufficient for happiness". One who has attained this sense of virtue would become a sage. In the words of Epictetus, this sage would be "sick and yet happy, in peril and yet happy, dying and yet happy, in exile and happy, in disgrace and happy,"
The Stoics therefore spent their time trying to attain virtue. This would only be achieved if one was to dedicate their life studying Stoic logic, Stoic physics, and Stoic ethics. "He recommended that one should concrete on the present day, and indeed on the very part of it in which one is acting and thinking. For only the present, he said, truly belongs to us, and not what has passed by or what we are anticipating: for the one is gone and done with, and it is uncertain whether the other will come to be"
Some immediate pleasures can create more than their equivalent of pain. The wise person should be in control of pleasures rather than be enslaved to them, otherwise pain will result, and this requires judgement to evaluate the different pleasures of life. Epicureanism was founded by Epicurus (c. 341 – c. 270 BCE). The goal his philosophy was to attain a state of tranquility (ataraxia, Greek: ἀταραξία) and freedom from fear, as well as absence of bodily pain (aponia, Greek: ἀπονία). Toward these ends, Epicurus recommended an ascetic lifestyle, noble friendship, and the avoidence of politics. (Philodemus, Herculaneum Papyrus, 1005, 4.9–14). The School of the Sextii was founded by Quintus Sextius the Elder (fl. 50 BCE). It characterized itself mainly as a philosophical-medical school, blending Pythagorean, Platonic, Cynic, and Stoic elements together. They argued that to achieve happiness, one ought to be vegetarian, have nightly examinations of conscience, and avoid both consumerism and politics, and believe that an elusive incorporeal power pervades the body. St. Augustine of Hippo (354 – 430 AD) was an early Christian theologian and philosopher whose writings influenced the development of Western Christianity and Western philosophy. For St. Augustine, all human actions revolve around love, and the primary problem humans face is the misplacing of love. Only in God can one find happiness, as He is source of happiness. Since humanity was brought forth from God, but has since fallen, one's soul dimly remembers the happiness from when one was with God. Thus, if one orients themselves toward the love of God, all other loves will become properly ordered. In this manner, St. Augustine follows the Neoplatonic tradition in asserting that happiness lays in the contemplation of the purely intelligible realm. St. Augustine deals with the concept of happiness directly in his treatises De beata vita and Contra Academicos. — Boethius, The Consolation of Philosophy. Boethius (c. 480–524 AD) was a philosopher, most famous for writing The Consolation of Philosophy. The work has been described as having had the single most important influence on the Christianity of the Middle Ages and early Renaissance and as the last great work of the Classical Period. The book describes many themes, but among them he discusses how happiness can be attainable despite changing fortune, while considering the nature of happiness and God. He posits that happiness is acquired by attaining the perfect good, and that perfect good is God. He then concludes that as God ruled the universe through Love, prayer to God and the application of Love would lead to true happiness. Avicenna (c. 980–1037), also known as 'Ibn-Sina', was polymath and jurist; he is regarded as one of the most significant thinkers in the Islamic Golden Age. According to him, happiness is the aim of humans, and that real happiness is pure and free from worldy interest. Ultimately, happiness is reached through the conjunction of the human intellect with the separate active intellect. Al-Ghazali (c. 1058–1111) was a Muslim theologian, jurist, philosopher, and mystic of Persian descent. Produced near the end of his life, al-Ghazali wrote The Alchemy of Happiness (Kimiya-yi Sa'ādat, (Persian: كيمياى سعادت‎‎). In the work, he emphasizes the importance of observing the ritual requirements of Islam, the actions that would lead to salvation, and the avoidance of sin. Only by exercising the human faculty of reason - a God-given ability - can one transform the soul from worldliness to complete devotion to God, the ultimate happiness. According to Al-Ghazali, there are four main constituents of happiness: self-knowledge, knowledge of God, knowledge of this world as it really is, and the knowledge of the next world as it really is. Maimonides (c. 1135-1204) was a Jewish philosopher and astronomer, who became one of the most prolific and influential Torah scholars and physicians. He writes that happiness is ultimately and essentially intellectual. St. Thomas Aquinas (1225 – 1274 AD) was a philosopher and theologian, who became a Doctor of the Church in 1323. His system syncretized Aristotelianism and Catholic theology within his Summa Theologica. The first part of the second part is divided into 114 articles, the first five deals explicityly with the happiness of humans. He states that happiness is achieved by cultivating several intellectual and moral virtues, which enable us to understand the nature of happiness and motivate us to seek it in a reliable and consistent way. Yet, one will be unable to find the greatest happiness in this life, because final happiness consists in a supernatural union with God. As such, man’s happiness does not consist of wealth, status, pleasure, or in any created good at all. Most goods do not have a necessary connection to happiness, since the ultimate object of man’s will, can only be found in God, who is the source of all good. Michel de Montaigne (1533-1592) was a French philosopher. Influenced by Aristotelianism and Christianity, alongside the conviction of the separation of public and private spheres of life, Montaigne writes that happiness is a subjective state of mind and that satisfaction differs from person to person. He continues by acknowledging that one must be allowed a private sphere of life to realize those particular attempts of happiness without the interference of society. Jeremy Bentham (1748-1832) was a British philosopher, jurist, and social reformer. He is regarded as the founder of modern utilitarianism. His particular brand of utilitarianism indicated that the most moral action is that which causes the highest amount of utility, where defined utility as the aggregate pleasure after deducting suffering of all involved in any action. Happiness, therefore, is the experience of pleasure and the lack of pain. Actions which do not promote the greatest happiness is morally wrong - such as ascetic sacrifice. This manner of thinking permits the possibility of a calculator to measure happiness and moral value. Arthur Schopenhauer (1788-1860) was a German philosopher. His philosophy express that egotistical acts are those that are guided by self-interest, desire for pleasure or happiness, where as only compassion can be a moral act. Schopenhauer explains happiness in terms of a wish that is satisfied, which in turn gives rise to a new wish. And the absence of satisfaction is suffering, which results in an empty longing. He also links happiness with the movement of time, as we feel happy when times moves faster and feel sad when time slows down. Władysław Tatarkiewicz (1886-1980) was a Polish philosopher, historian of philosophy, historian of art, esthetician, and ethicist. For Tatarkiewicz, happiness is a fundamental ethical category. Herbert Marcuse (1898–1979) was a German-American philosopher, sociologist, and political theorist, associated with the Frankfurt School of critical theory. In his 1937 essay 'The Affirmative Character of Culture,' he suggests culture develops tension within the structure of society, and in that tension can challenge the current social order. If it separates itself from the everyday world, the demand for happiness will cease to be external, and begin to become an object of spiritual contemplation. In the One-Dimensional Man, his criticism of consumerism suggests that the current system is one that claims to be democratic, but is authoritarian in character, as only a few individuals dictate the perceptions of freedom by only allowing certain choices of happiness to be available for purchase. He further suggests that the conception that 'happiness can be bought' is one that is psychologically damaging. Viktor Frankl (1905-1997) was an Austrian neurologist, psychiatrist, Holocaust survivor and founder of logotherapy. His philosophy revolved around the emphasis on meaning, the value of suffering, and responsibility to something greater than the self; only if one encounters those questions can one be happy. Robert Nozick (1938-2002) was an American philosopher. In his 1974 book, Anarchy, State, Utopia, he proposed a thought experiment where one is given the option to enter a machine that would give the maximum amount of unending hedonistic pleasure for the entirety of one's life. Scientism is the approach that the empirical sciences are the most valuable branches of learning and culture. Happiness economics is the quantitative and theoretical study of happiness, positive and negative affect, well-being, quality of life, life satisfaction and related concepts, typically combining economics with other fields such as psychology and sociology. The tracking of Gross National Happiness or the satisfaction of life grow increasingly popular as the economics of happiness challenges traditional economic aims. Sonja Lyubomirsky asserted in her 2007 book, The How of Happiness, that happiness is 50 percent genetically determined (based on twin studies), 10 percent circumstancial, and 40 percent subject to self-control. Lyubomirsky suggests a twelve-point program to maximize the final 40 percent. ↑ Cassin et al. Dictionary of Untranslatables. Princeton University Press, 2014. Print. ↑ Richard D. Mohr, "A Platonic Happiness". History of Philosophy Quarterly, Vol. 4, No. 2 (Apr., 1987), pp. 131-145.University of Illinois. ↑ Book I Chapter 1 1094a. ↑ Xenophon, Symposium, iv. 41. ↑ Diogenes the Cynics: Sayings and Anecdotes with Other Popular Moralists, trans. Robin Hard. Oxford University Press, 2012. Page 152. ↑ Diogenes the Cynics: Sayings and Anecdotes with Other Popular Moralists, trans. Robin Hard. Oxford University Press, 2012. Page 124. ↑ Vincent Cook. "Epicurus - Principal Doctrines". epicurus.net. ↑ Hutchinson, D. S. (Introduction) (1994). The Epicurus Reader: Selected Writings and Testimonia. Cambridge: Hackett. p. vi. 1 2 "Philosophical thought of the School of the Sextii - Di Paola - EPEKEINA. International Journal of Ontology. History and Critics". ricercafilosofica.it. ↑ "Achieving Happiness: Advice from Augustine". Psychology Today. 1 2 "True Happiness and The Consolation of Philosophy". catholic.com. ↑ Dante identified Boethius as the "last of the Romans and first of the Scholastics" among the doctors in his Paradise (see The Divine Comedy and also below). ↑ "Avicenna (Persian philosopher and scientist) - Britannica Online Encyclopedia". Britannica.com. Retrieved 2012-01-07. ↑ "International Handbook of Inter-religious Education". google.ca. ↑ "Influence of Arabic and Islamic Philosophy on the Latin West". stanford.edu. ↑ Bodman Jr., Herbert L. "(untitled)." Rev. of The Alchemy of Happiness Translated by Claud Feild and Revised by Elton L. Daniel. Journal of World History Fall 1993: 336-38. Print. ↑ Imam Muhammad Al-Ghazali (1910). "The Alchemy of Happiness". Retrieved 8 January 2016. This article incorporates text from this source, which is in the public domain. 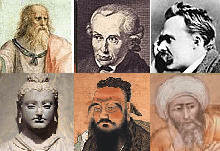 ↑ "Maimonides - Internet Encyclopedia of Philosophy". utm.edu. ↑ "Summa Theologica: Treatise On The Last End (QQ-5): Question. 3 - WHAT IS HAPPINESS (EIGHT ARTICLES)". sacred-texts.com. ↑ Catholic Online. "St. Thomas Aquinas". catholic.org. 1 2 3 4 "Aquinas: Moral Philosophy - Internet Encyclopedia of Philosophy". utm.edu. ↑ ST, I-II, Q. 2, art. 8. ↑ "SparkNotes: Thomas Aquinas (c. 1225–1274): Summa Theologica: The Purpose of Man". sparknotes.com. 1 2 "Montaigne, Michel de - Internet Encyclopedia of Philosophy". utm.edu. 1 2 "Bentham, Jeremy - Internet Encyclopedia of Philosophy". utm.edu. ↑ Arthur Schopenhauer, The World as Will and Idea. Cologne 1997, Volume One, §52th. ↑ "Władysław Tatarkiewicz," Encyklopedia Polski, p. 686. ↑ "A Lesson About Happiness From A Holocaust Survivor - Business Insider". Business Insider. 22 October 2014. ↑ Feser, Edward (4 May 2005). "Nozick, Robert". Internet Encyclopedia of Philosophy. ↑ Richard Layard, 2006. "Happiness and Public Policy: A Challenge to the Profession," Economic Journal, 116(510), Conference Papers, pp. C24-C33. ↑ "Are You Happy? by Sue Halpern". nybooks.com. Dalai Lama, co-authored with Howard C. Cutler, The Art of Happiness, 2003. Jonathan Haidt, The Happiness Hypothesis: Finding Modern Truth in Ancient Wisdom, 2006.